IGCAT was invited to the 1st Asian Network of Cultural Intermediaries Forum in Taiwan, 2-3 November. The invitation came from the Graduate School of Arts Management and Cultural Policy, National Taiwan University of Arts. It was an opportunity for IGCAT’s President, Dr. Diane Dodd to meet the Deputy Minister for Culture and to present the Regions of Gastronomy project. 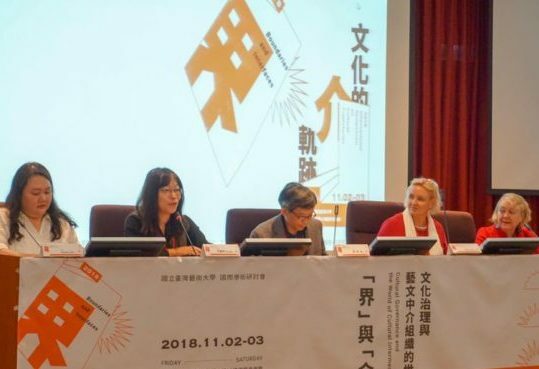 The Forum brought together intermediaries from the cultural sector in Taiwan including artists residencies, arts spaces, festival managers, research bodies, university departments and students. In addition, international representatives joined the meeting from the Japan Foundation; the National Arts Council Singapore; Korea Culture and Tourism Institute and Mihidol University. Questions of membership and organisation will still need to be discussed further but the network was looking for endorsement from all the international partners present. IGCAT’s Board will now be consulted on their interest to endorse such a partnership.